These Are some daylight tubes I had got from leominster I don't want to kill my classics. Definitely! Use these things and save the golden oldies! Any Chinese lamp looks nice if it's daylight. I believe you can run F25T8 lamps on these ballasts. I mean the full wattage 3foot ones. Then you can have a nice CRI with commonly available lamps without changing anything else. I wonder if I could run f30t12 lamps? If they would be underdriven? F30T12 lamps have a less arc voltage than F30T8. Some ballasts may be more stressed than others when going from the 30w T8 to T12. The 30T12 wouldn't be under-driven, most likely, though. Running an f30t12 on a f30t8 fixture is like running an f34t12 on an f40t12 ballast. As long as the ballast doesnt get too hot it's ok but better not to use them. Are F25T8 and F30T8 the same lamps ? and can they be interchanged? Most ballast list F30T8 and F30T12. What ballast is in the fixture? I always thought F25 lamps were the same as F30 lamps only rated differently because the F25 are intended for electronic ballasts. Sort of like F40 shop light lamps that are rated at 25 watts. 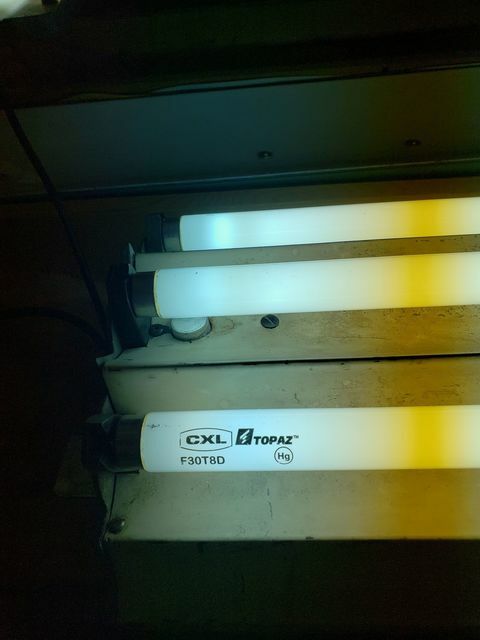 Oh yeah those 25 watt f40 lamps I used to be confused why they ran the same in a f40 fixture. But the reason is those belong in a cheap low power shop light fixture. From what I understand, the F30T8 and F40T12 are electrically similar. And F30T12 and F34T12 are electrically similar. The F30T8 and F25T8 have similar arc voltages but the F30T8 has a higher current rating and preheat designed electrodes. That being said, an F25T8 shouldn't hurt a F30T8 ballast...but may be a bit hard on the lamp.